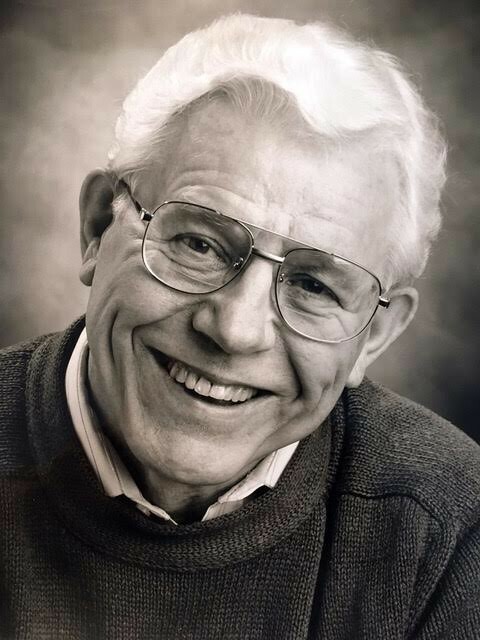 Harold F. Derks was born 91 years ago in Grand Rapids, and he died on February 9, 2019. Harold spent most of his life in West Michigan. He graduated from Central High School and served in the Army as an MP in New Mexico at Los Alamos. After his stint in the service, he went to GRJC and Michigan State College on the GI bill, becoming a civil engineer. Later, he attended Garrett-Evangelical Theological Seminary and became an ordained Methodist minister. The Derks family moved to Holland, MI, in 1963 where Harold took a position as the Associate Minister at First Methodist Church. He returned to engineering after a couple of years in the ministry, becoming Holland’s City Engineer for several years, then working for the State of Michigan Department of Transportation as the Contracts Administrator, building roads and bridges. He stayed active at his new church home, Fountain Street Church, participating in GAS (Gentlemen Around Sixty, well past their sixties! ), and serving on committees. He was also an active member of Golden K Kiwanis for a number of years. Harold was passionate about: swimming (he took many prizes in Masters competitions), MSU sports, making pottery, and his family. He was preceded in death by his parents (Helen and James Derks), two brothers (Robert and Dean Derks) and two sisters (Laura Swartz and Dorothy Huizinga). He is survived by his wife of 64 years, Carol Sennema Derks; three children: Margi Derks Peterson, Jim (Carol), and Bill (Colleen) Derks; and seven grandchildren: Alice Peterson (David Server), Halcyon Derks (Jeff Martin), Daedalian (Karla) Canela-Derks, Torri Derks, Abby (Adam) Troyer, Keaton and Cooper Derks; his sister Shirley (Schuitema) Tindall, sister-in-laws Mary (Sennema) Scovel and Louise (Raum) Derks, brother-in-law David Sennema; and many beloved nieces, nephews, and friends. Harold was “the hugging grandpa”, as described by one of his grandchildren, and his genial and generous spirit uplifted many lives. He will be missed. A memorial service will be held in the sanctuary at Fountain Street Church, 24 Fountain St, NE, Grand Rapids, MI, at 2:00 p.m. on February 26. All are invited to a reception in the social hall following the service to greet the family and share stories. Contributions may be made to Fountain Street Church or to Hospice of Michigan in lieu of flowers.